PT Problem of the Day: Bus/train interchanges – why are the bus stops so far from the trains? Good connecting services are vital for making more trips viable by public transport. 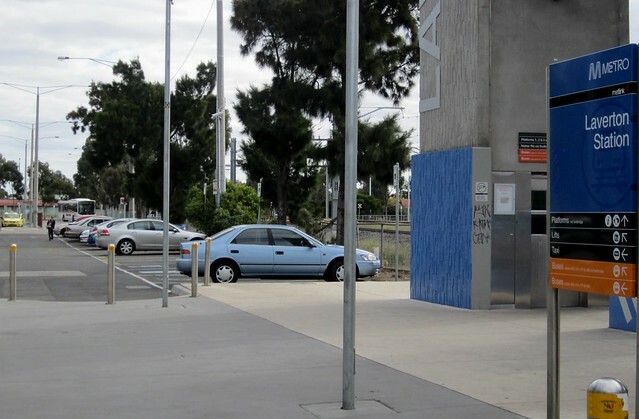 In the case of feeder buses to stations, frequent services with good interchange facilities can help relieve station car parks, and make it easier for those travelling across the day — not just the lucky few who can drive to a station before all the parking is full. Unfortunately at many stations the interchange facilities leave a lot to be desired. This is Laverton, recently upgraded at a cost of almost $93 million. So why did they not put the bus stops next to the entrance to the platforms? To change from a train to a bus (or a taxi), you have to go up one set of stairs, across the bridge, down more stairs, and then take a long walk through a car park. And hope it’s not raining.